I have amassed a huge stack of WIPs over the years. For every type of craft I have ever tried, there are at least a couple of unfinished projects waiting in the wings. I'm not really sure why this has become such a recurring pattern since I love the feeling of finishing a project, sending it off to its new home and watching people enjoy it for years to come. Most of my quilts end up getting stalled after they are basted and ready to quilt. 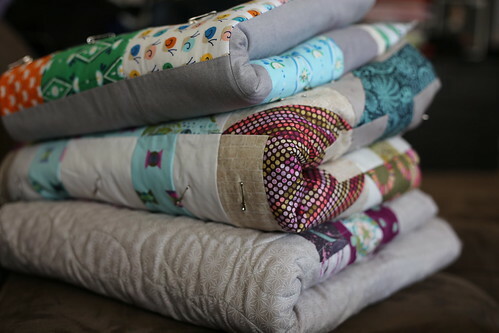 Currently, I have at least 6 quilts that are just waiting to be quilted and bound. I can't quite explain it but there is definitely something about the process of choosing a quilting design and forcing the quilt sandwich through my machine that makes me cast a project aside faster than you can say "new fabric." Three of these almost finished quilts are taking up some prime real estate on our living room couch. I'm going to try and tackle them this weekend since two are baby quilts that should really get mailed off before the intended recipients start walking. That said, there is a good chance I'll get distracted by this little number somewhere along the way. 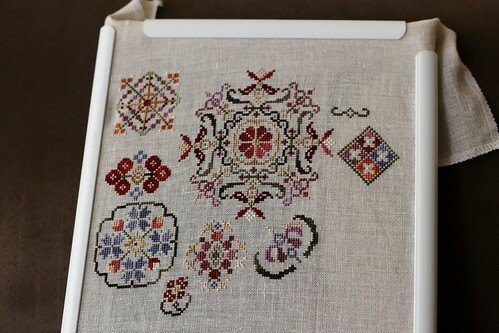 That is the Spring Quakers pattern by Rosewood Manor that I started just about a year ago. Most of my slow and steady progress on this project happens when I am supposed to working on something else. Those beautiful hand-dyed Valdani flosses with their perfectly saturated colours are irresistible when facing something I "should" be doing. Do you have some long-forgotten WIP skeletons in your closet? At what stage do you usually get bogged down? Any tricks for "breaking the cycle?" Please do tell! 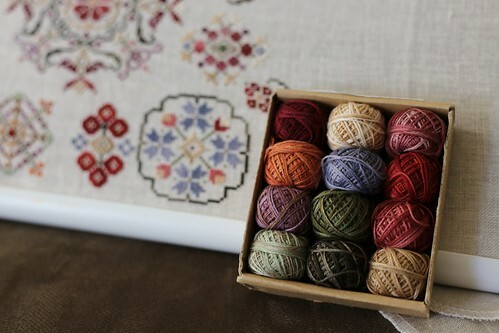 Those threads are beautiful - good luck getting your quilts finished! Too many skeletons! I've been trying to tackle my wips lately, but it seems never ending ! Pick a day (WIP Wednesday?) that you can't work on anything new until you've tackled one of those skeletons.